The fourth and last workshop of ASEAN-QA TrainIQA Phase III took place from 19 March 2018 until 21 March 2018 in Bangkok, Thailand. Within the three workshop days the participants learned about the importance of effective reporting, the challenges of organisational change and how to combine strategic management with quality assurance. They also discussed the measuring of impact and how quality assurance provides tools to investigate the effects of activities. At the end of the Workshop there was a very fruitful discussion about quality culture and the future of it within the ASEAN Countries and institutions. Apart from the training sessions a visit at KMUTT (King Mongkut’s University of Technology Thonburi) took place with a campus tour and presentations. 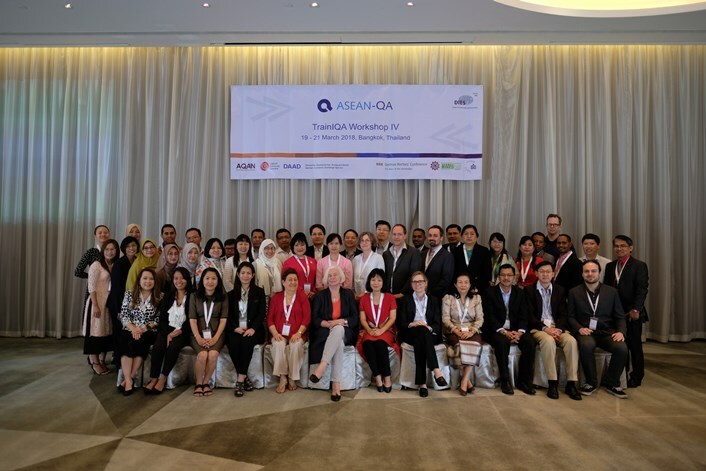 After a successful last workshop of the ASEAN-QA TrainIQA Phase III all participants looked forward to the ASEAN-QA Final Conference which was organised back to back with the workshop. The Final Conference served as platform to present and to get feedback for the individual projects of each participant and moreover to discuss the current state and future of quality assurance in the ASEAN Countries.